Congratulations on taking this powerful step to pursue the Certified Resume Specialist (CRS+X) credentialing process. 1. Category for which you are requesting evaluation. View current list. 2. Proof of certification held. 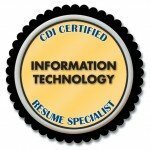 If it is not a CDI credential you will need to include a scanned copy of your certificate. 3. Portfolio of 4 industry-specific resume samples.